The development of library workflows and associated support (such as alerts) is a priority task for KB+ developments in Autumn 2012. In order to ensure grounded input from the start, we’ve established a task group running from June to September, with volunteer members from the library teams at Birmingham, Cambridge, Kings and Salford. Other institutions are helping with parallel reports and user interface task groups. The workflow group has agreed a simple five-step work plan. Step 1 – Agree what we mean by ‘workflow’ and which types of workflow support will make KB+ most useful to library operations. We listed seven types of activities ranging from coordinating publisher updates and supporting renewals decisions (both really important) to task-based messaging within the local library team (not a priority – email does that pretty well for now). 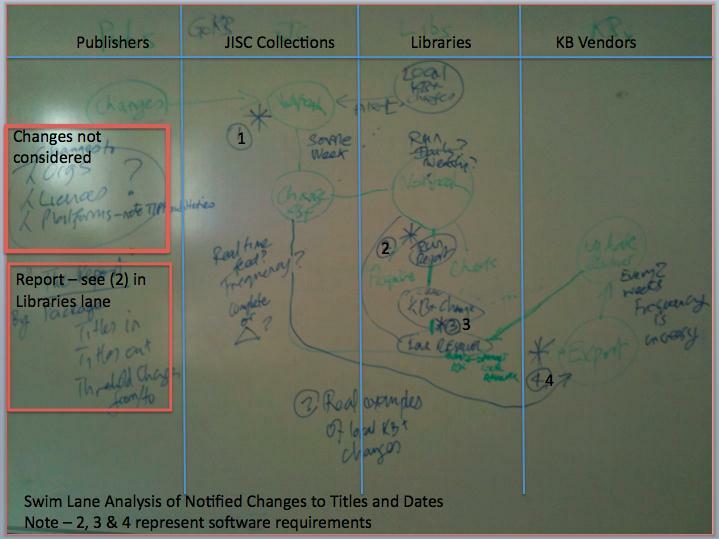 Step 2 – Meet up to detail the important workflows that will make a difference from Autumn 2012 onwards. The Cambridge team kindly hosted 9 of us on 27 June, when we focused on publisher updates and decision support around new deals and renewals. We covered approximately 75 square feet of white board space in 4 hours (sounds impressive), generating just 5 iPhone photos (all that work for 5 low quality snaps) … and a mass of important thinking. We found an old fashioned ‘swim lane’ diagram (once it was explained to us by @owenstephens) to be a good way of systematizing workflow actions and ideas as a shared service design – each column in the diagram relates to a key actor in the envisaged process. From this annotated photo of our efforts, you can see that the write up in Step 4 will be essential to bring this to life! Step 3 – Compare our ideas with GOKb partners. KB+ is collaborating with the Mellon Foundation funded GOKb (http://gokb.org/post/25021222983/gobkpressrelease) project involving four US Higher Eds from the Kuali OLE consortium (Chicago, Duke, North Carolina State and Penn). We want to leverage their efforts with data beyond the UK deals and also share ideas about optimal workflows between local library, above-campus and vendor functions. We’ll also look at the Kuali Rice community source software that they are using to enable workflows. We have two meetings in July and August. Step 4 – Draft and mutually agree a report. As emphasized by the KB+ Community Group, this report needs to be an accessible document that sets out the workflow priorities for KB+ development from the perspective of how they will fit with real library operations and key local systems (such as Link Resolvers). It will also provide the ‘Use Case’ requirements to inform the development team. The final report will be reviewed by the group in early September. Step 5 – Use the report as the basis for a library update meeting in the autumn. Our group is suggesting that the report should form a good basis for a UK community update meeting for managers and practitioners to discuss how KB+ will fit and enhance their practices and lessen their local workload. Over the last few weeks I’ve spoken at a number of events bringing people up to date about KB+ and the data and services that will be available from launch. In the course of those events it’s become clear that the provision of licensing information for library systems is attractive to both academic libraries and the systems vendors who support them. Systems vendors have found it challenging to get hold of the content provider licences, and then map them in a way that can be displayed usefully to institutions in their systems. This has meant that Libraries have largely been left to do the job of populating the licensing modules in their systems by themselves, which doesn’t work because they often lack confidence in their ability to interpret the licences or the time it would take to do this work across all the licences they are responsible for. Closely related to both of the above is that the licences being negotiated, sometimes end up being somewhat hazy on some of the key questions that librarians ask of them. Now whilst haziness is often an advantage from a legal point of view (it’s difficult to be accused of breaching a licence when it’s far from clear what a clause actually means or if a particular use case was even covered by the licence), it’s a pain in the neck if you are just trying to give someone a straight answer to an apparently simple question. It also makes the job of representing a licence in a library (or any other) system very difficult indeed. Well, if the work to map a licence and enter it into an ERM is being repeated by each institution on the same licences, that is a huge amount of time across the sector being spent by senior staff, who could in all probability be better employed doing something else. On the other hand, if the work isn’t being done at all, then a lot of expensive functionality is going to waste and libraries aren’t in a position to efficiently make their users aware of licence information. Finally, there is a knock on impact on decision making within the institution – what services can I offer to users? What resources do I want to subscribe to? What print can I dispose of? – all of these decision either rely on or can be informed by access to licence information. JISC Collections is currently trying to help address these issues through the Electronic Licence Comparison and Analysis Tool (elcat) and Knowledge Base+, both of which approach the issue in slightly different ways. Over the last 2 years JISC Collections has been mapping a large number of its licences into ONIX-PL – a NISO standard for the expression of licence agreements in a machine readable way, developed by EDItEUR specifically for use by publishers, ERM and other library system vendors. ONIX-PL allows us to capture the whole of the licence and even if the licences themselves aren’t consistent, the mapping process is, which allows us to view a consistent expression of all our licences and to compare different licences with each other efficiently. There are now 135 licences in elcat covering JISC Collections model licences, e-journal, e-books, databases and archive agreements going back as far as 2008 in some cases. It’s has been used by over 100 institutions since it was launched in March. We hope that elcat will simplify the process by which institutions get to the information in a licence that they need to answer a query or inform a decision, for example, are walk-in users allowed under the terms of this licence, or perhaps more usefully, which of my licences DON’T provide for walk-in users. 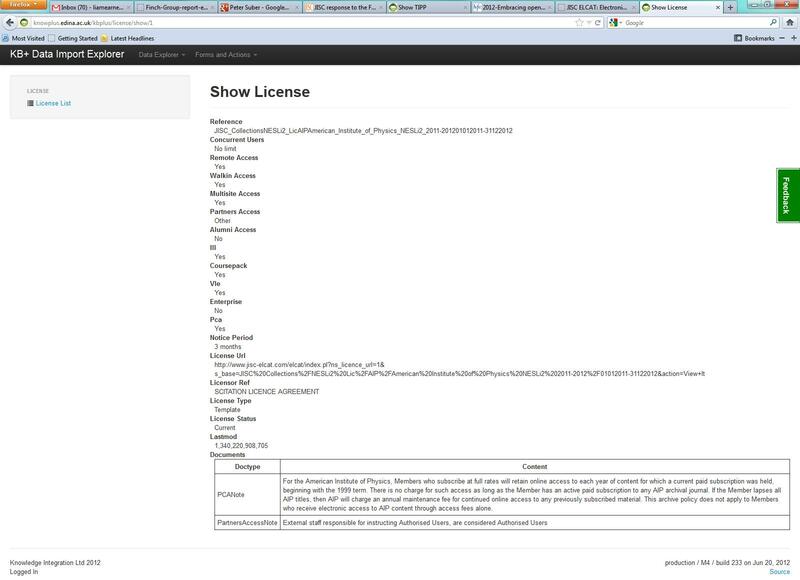 Creating the licence expressions is time consuming, and it isn’t clear that there is high demand. 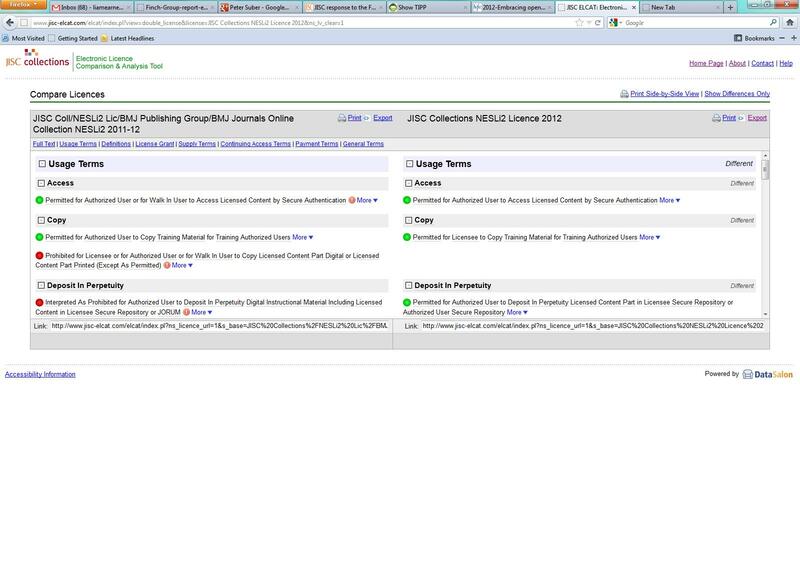 Currently elcat, only includes JISC Collections licence agreements. Whilst this isn’t a bad thing, the fact is that they are all pretty similar and the real value would start to come from being able to compare completely different licences with each other. Unfortunately, at present, very few people, other than KUALI in the US, are mapping licences in ONIX-PL. This raises the question of whether it’s a viable activity in the longer term – even if we believe that it is of value. Fortunately I’m happy to say that at least one major ERM vendor is currently mapping all of our ONIX-PL licence expressions to their licensing module. ONIX-PL can only represent what is in the licence – if there is an absence of information or clarity it can’t provide a response. Despite all of our efforts even JISC Collections licences aren’t always as clear as we would perhaps like on some key questions – post-cancellation access entitlements being one that comes to mind. However, the discipline of creating ONIX-PL versions has highlighted this and colleagues are working to try and ensure that in future licences will be much clearer. Currently elcat is in something of a beta phase where we’ll be adding licences to it and working with our members to see if there is demand, and how we might improve it in the future. Wherever possible, we will be trying to derive this information from the ONIX-PL expressions that we’ve created already so that KB+ can be at least partially pre-populated as soon as a new licence expression enters elcat. These values can be supplemented with additional notes and commentary – currently JISC Collections is adding the information, but once the system is live, individual institutions will be able to add information that can either be private or shared across all institutions. The advantage of these notes is that it allows us to provide information on, for example, post-cancellation access, that is contained within an offer document rather the licence, but which adds to the comprehension of the licence. Finally, we’ll be linking to the full licence expression in elcat, so that institutions can see the whole thing and allowing institutions to upload their own versions (scanned PDFs for example) into the system. We hope that this approach will answer key questions for institutions and point them to where they can find further information, saving time and improving access to information and knowledge for all users. Currently we’re testing KB+ with academic institutions to make sure that we are adding clarity and not just another layer of confusion! The ethos behind KB+ is ‘do once and share’. We’re very happy to share the work that we’ve done with institutions, publishers and systems vendors so that the supply chain as a whole can benefit, but we would really like to see more people get involved in the creation of these licence expressions across a wide range of resources and make them openly available. JISC Collections doesn’t cover all resources and this means that whilst we can have a good attempt at creating the licence expression or details of key values, it’s potentially more challenging to start adding interpretative notes. Of course, if we do KB+ right that might not matter since we’ll have access to the combined knowledge of all those librarians who have been working with those licences over the years and what they’ve learnt.